OH MY GOD. Shield your eyes, folks, it’s Chesty Anderson U.S. Navy (1976) in its entirety. Horrible print, horrible film, and Timothy’s most over-the-top, unhinged performance ever. Well, maybe tied with The World’s Greatest Sinner (1962). Today is the birthday anniversary of not one but two great men who played important roles in Timothy’s career. After wondering why I never noticed this before, I thought it fitting to pay tribute to both of them at once. First up is Kirk Douglas, who turns an incredible 99 years old today. He may not have been thrilled with Tim’s improvisational acting style in Stanley Kubrick‘s Paths of Glory (1957), but you would never know it from this scene, from the court-martial of the three scapegoated prisoners. John Cassavetes, who did appreciate Tim’s freestyle approach to his craft, was born on this date in 1929. He managed to capture Tim’s essence in two fantastic films, Minnie and Moskowitz (1971) and The Killing of a Chinese Bookie (1976). Here is Tim’s appearance in the former film, with star Seymour Cassel, in its glorious entirety. Well this is not how I wanted to end “Timothy in Color Week,” I can assure you. Robert Loggia, character actor and tough guy extraordinaire, passed away today at the age of 85. He and Timothy only made one film together, the drive-in classic Speedtrap (1977). To mark his passing, let’s share not only a pic from that film but a video clip as well. From Somebody Up There Likes Me (1956) to The Sopranos (2004), Loggia marked whatever project he found himself in with the indelible stamp of his personality. He will truly be missed. Two weeks without posting – yikes! My apologies, folks. Well, as tomorrow’s Thanksgiving here in the US, I thought I would make our Video of the Week something that we can all be extremely thankful for. We’ve shown it before, but here it is again – Timothy’s performance as Lute Purdy, fur trapper and bounty hunter, from the Daniel Boone episode “The Blackbirder”. It first aired on October 3, 1968. Lute is one of Tim’s most richly drawn characters, and he’s in practically every scene. Another thing we can be thankful for! Also, Lute just looks like the kind of guy who would go out and shoot wild turkeys, or something. Doesn’t he? Happy Thanksgiving, everyone! We were very sad to learn today of the sudden death on Halloween of Charles Herbert, child star of the 1950s and ’60s and Timothy’s nemesis in Bert I. Gordon‘s The Boy and the Pirates (1960). As it’s Video of the Week Wednesday, we dug into the archives and are re-posting this enjoyable video review of Pirates. 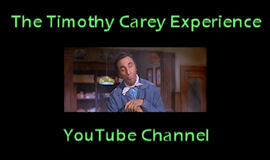 “Do you know who Timothy Carey is?” Herbert asked Classic Images during a 2006 interview. “He, on that movie [Pirates], probably scared me more than the Colossus of New York [laughs]! But he was a nice man, and he always tried to make you feel, ‘I’m not really crazy,’ and you would say, ‘Okay.’ And then he would walk away and you’d go, ‘He’s CRAZY!’ He was a scary man.” We wish Mr. Herbert peaceful rest.